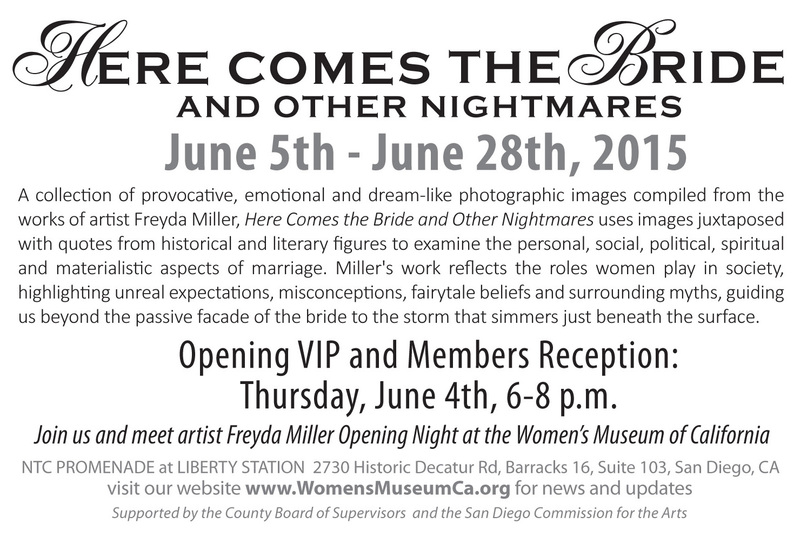 Please join us Friday June 5th 6 to 9pm for the public opening of Freyda Miller’s solo show Here Comes the Bride and Other Nightmares. This special exhibition based on her book with the same name opens at the Women’s Museum of California in San Diego. Freyda Miller resides in Los Angeles where she works as a visual artist. She is a graduate of the UCLA Fine Art Department, with a major in Painting, Sculpture, Graphic Arts and an emphasis in fine art photography. While working on her personal art she also began her own business, Prop Connection West, providing styling and production coordinating services for photographers and production companies on the East Coast, Midwest and the Los Angeles area. Her 20 years of experience in this area encompassed set decorating, casting, wardrobe, location scouting and props. Her work is exhibited widely and has been collected by The St. Louis Museum of Art, The New Orleans Museum of Art, The Rijksmuseum: Amsterdam, Tokyo and Fuji Art Museum: Tokyo, Peter Palmquist Archives at Yale University: Women In Photography International Archives and UCLA Library, Department of Special Collections.